Miller’s Surplus is proud to offer our customers more gratitude and appreciation for their patronage. 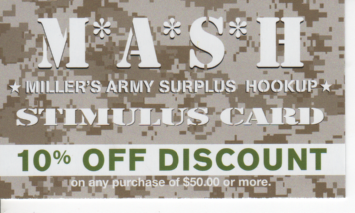 GET YOUR M*A*S*H Stimulus Card below, good for 10% off any purchase over $50. • EVERYDAY – Active, Reserve & Retired Veterans receive a 10% discount with a valid ID. • TUESDAYS – Seniors (55+) receive 10% off their purchase. • WEDNESDAYS – Law Enforcement, Firefighters, EMTs, Paramedics and Volunteer First Responders will receive a 10% discount. • THURSDAYS – College Students with a valid UofA or Pima Community College ID will receive 10% off their purchase. Discount may not be combined with any other offers, one per person per visit. Must present valid ID.